A new type of person is coming into incarnation right now, almost a “next step” in human evolution. These people hold great hope for the future—the promise of a new humanity and civilization. They are visionary and creative, progressive and independent. They carry new energies and manifest different ways of thinking and feeling. These people are called “Indigo,” because the color indigo (the color seen in the “third eye”) is unusually prominent in their aura. You may be familiar with the concept of “Indigo Children” and never realized that there are also Indigo adults...or that you might be one of them! • Feelings of being separate or misunderstood? • Frustrations and dissatisfactions with the “normal” world? • A deep feeling, thinking, and introspective nature? • A driving need to contribute to creating a better world? • A powerful longing for something more? Indigo Adults is rooted in the authors’ personal experiences of the subtle dimension of life and reflects their explorations into the esoteric and mystic teachings of many traditions. This subtle dimension is not tangible to our “normal” analytical mind, and it is only beginning to be scientifically documented. Take what the authors are presenting as a hypothesis. Experiment with it, and come to your own conclusions. 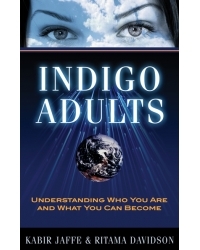 Indigo Adults will help you identity if you (or your children) are Indigos and understand yourself, and especially your purpose as an Indigo here on Earth more clearly. Kabir Jaffe is one of the pioneers of the new energy-based psychology and spirituality. He is a master energy trainer and guide for inner development, as well as a scientist, mystic, futurist, and astrologer. He has been involved in inner work for 35 years, 18 of which were spent in a monastery in India. Ritama Davidson is a gifted energy worker and international seminar leader whose unique sensitivity allows her to accurately diagnose and guide people on the path of inner development. She is the co-founder of Essence Training and has been a dancer, choreographer and practitioner of Shiatsu massage and body-oriented therapy. Together they run the Essence Training Institute, an Inner Work School. They live in the Caribbean.